The battle for GPU price vs. performance is as old as the GeForce 2 MX. In fact it was the GeForce 2 MX that was my first "real" gaming graphics card. It played the original SiN, Half-Life and Unreal Tournament just fine. It was much cheaper than the full-blown GeForce 2 GTS, Pro or Ultra. While it had half of the pixel pipelines of the GTS or higher, it did at least have Hardware TnL and got me gaming. Thankfully, the trend has continued and companies still produce GPU models that are made more for the mainstream market. The enthusiast and gaming market is big money for sure, but most people can't drop the coin for a 7950 GX2. When nVidia launched the 6600GT, it was a great step in the right direction. They got over the blunders of the GeForce 5x00 series, and got back on track with good products. The 6600GT could be had for cheap and it featured all of the technology of it's more expensive siblings. The hitch is that it has 128-bit DDR3 memory instead of 256-bit. Clock-for-clock it will be slower, but when it debuted, it was priced just over the $200 mark - making it affordable for people who really want to game, but can't afford the best. As for scalability, the 6600GT was SLI-ready so you could increase your GPU horsepower by simply plugging in a second 6600GT. For a while a 6600GT SLI setup ran faster than other more expensive single card setups. nVidia has followed up the GeForce 6 series with the GeForce 7 series, and their good mid-range card has become the 7600GT. This card is priced in the same range as the 6600GT was upon its release, but packs more punch as it's memory is clocked higher, and it features some updated technology. The questions we are trying to find out today are: How does the 7600GT really perform, and how much better is it than the 6600GT? 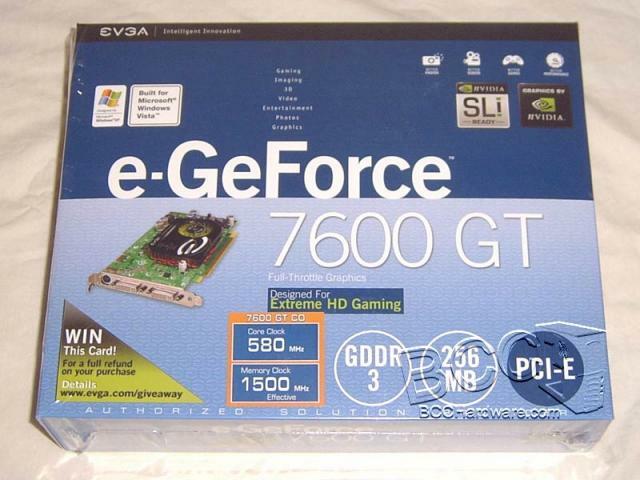 Keep on reading as we take a look at the eVGA 7600GT CO. Here is a list of the specs and features from eVGA's website. Delivers up to 2x the shading power of previous generation products, taking gaming performance to extreme levels. Based on the OpenEXR technology from Industrial Light & Magic (http://www.openexr.com/), NVIDIA's 64-bit texture implementation delivers state-of-the-art high dynamic-range (HDR) visual effects through floating point capabilities in shading, filtering, texturing, and blending. The combination of high-definition video processors and software delivers unprecedented picture clarity, smooth video, accurate color, and precise image scaling for all video content to turn your PC into a high-end home theater. Enhances the performance of bleeding-edge games like id Software's DOOM 3, that feature complex scenes with multiple light sources and objects. It sounds like it has a lot going for it. Click the next page as we take a look and compare the eVGA's 7600GT CO with the standard issue 7600GT and a 6600GT.